which shows that R > 1 is required for a steady state (as it must be) and that higher values of the search effectiveness reduce both host and parasitoid steady state values. The sad fact, however, is that this perfectly sensible model gives perfectly nonsensical predictions when the equations are iterated forward (Figure 4.3): regardless of parameters, the model predicts increasingly wild oscillations of population size until either the parasitoid becomes extinct, after which the host population is not regulated, or both host and parasitoid become extinct. To be sure, this sometimes happens in nature, usually this is not the situation. Instead, hosts and parasitoids coexist with either relative stable cycles or a stable equilibrium. In a situation such as this one, one can either give up on the theory or try to fix it. My grade 7 PE teacher, Coach Melvin Edwards, taught us that ''quitters never win and winners never quit,'' so we are not going to give up on the theory, but we are going to fix it. The plan is this: for the rest of this section, we shall explore the origins of the problem. In the next section, we shall fix it. Figure 4.4. The stability of the steady state of the one dimensional dynamical system N(t + 1) = f(N(t)) is determined by the derivative of f(N) evaluated at the steady state N.
Figure 4.3. Although the Nicholson-Bailey model seems to be built on quite sensible assumptions, its predictions are that host and parasitoid population sizes will oscillate wildly until either the parasitoids become extinct (panel a, H(1) = 25, P(1) = 8, R = 2 and a = 0.06) and the host population then grows without bound, or the hosts become extinct (panel b, H(1) = 25, P(1) = 8, R = 1.8 and a = 0.06), after which the parasitoids must become extinct. (c) Some host-parasitoid systems exhibit this kind of behavior. On the left hand side, I show the population dynamics of the bruchid beetle Callosobruchus chinesis in the absence of a parasitoid (note that this really cannot match the assumptions of the Nicholson-Bailey model, because there is regulation of the population in the absence of the parasitoid); on the right hand side, I show the beetle and its parasitoid Anisopteromaluscalandre. In this case, the cycles are indeed very short. 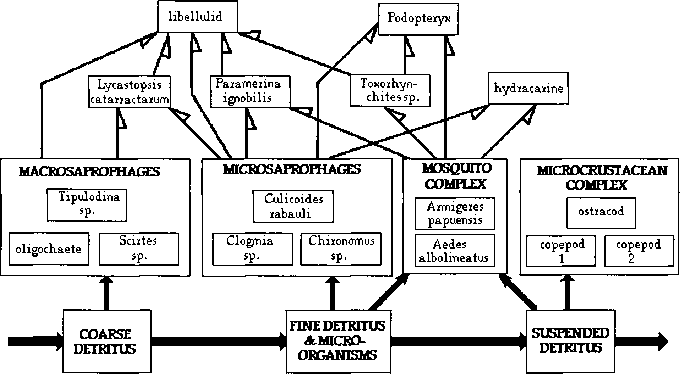 (d) On the other hand, many host-parasitoid systems do not exhibit wild oscillations and extinction. Here I show the dynamics of laboratory populations of Drosophila subobscura and its parasitoid Asobara tabida. The data for panels (c) and (d) are compliments of Dr. Michael Bonsall, University of Oxford. Also see Bonsall and Hastings (2004). and we conclude that the steady state will be stable, in the sense that perturbations from it decay, if | fN (N)| <1.